Jackie Booth danced to the music of Amy Hanaiali'i Gilliom during yesterday's banquet at China's Great Hall of the People in Beijing. The event marked the dedication of a Hawaii trade and tourism office in China's capital. BEIJING » The state of Hawaii marked the establishment of an official trade and tourism office in China yesterday with a hula and Hawaiian music performance at the seat of communist power. 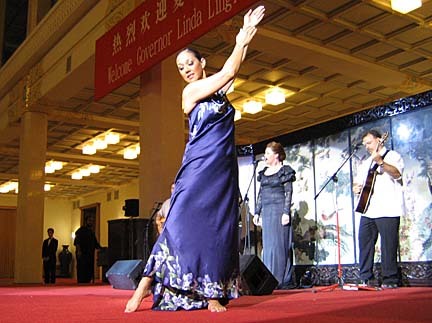 In an odd juxtaposition of hula under massive murals glorifying Mao Zedong's exploits, singer Amy Hanaiali'i Gilliom, slack-key guitarist Brian Kessler and dancers from the Polynesian Cultural Center brought a brief touch of aloha to the Great Hall of the People, home of China's rubber-stamp Parliament. Hawaii is now just the second U.S. state, along with Nevada, to have an official business promotion office in China. The Beijing office had been in place previously but has been limited in what it can do without official recognition from authorities. China is very officious. To get anything done, "official status" is a must, said Ted Liu, director of the state Department of Business, Economic Development and Tourism. Liu said the office, which helps Hawaii companies seeking China business, now also gives Hawaii an official voice in China on trade and tourism matters near policy-makers in Beijing. But whether the move will lead to a sudden flowering of Hawaii's near-negligible business relationship with China remains uncertain. "I don't think this will make much difference at all," said Johnson Choi, a China business consultant with offices in Hawaii and Hong Kong. Liu said due to tight state funding, there are no plans to expand programs to capitalize on the new status. Hawaii has little so far to export to China anyway. Its largest single export item is scrap metal for China's voracious raw-material needs. The office's director, Bo Wu, said the greatest benefit of official status is that it will allow DBEDT to hold a real dialogue with Chinese authorities on relaxing Chinese restrictions on leisure travel to the United States. The United States and China are due to have preliminary talks next month that might eventually lead to a loosening of the rules. The contrast of last night's fanfare with the reality of the office's challenges in China is emblematic of the Hawaii trade mission now on a swing through China led by Gov. Linda Lingle. The state hopes to drum up business and tourism for Hawaii, but it will be difficult to be heard above the crowd clamoring for a piece of China's growing business pie. At least eight state governors will have visited China before the year is out. Yesterday, a planned meeting between Lingle and either the country's president or premier was canceled by the Chinese. No reason for the cancellation was given. The Beijing office, however, has played a role in pulling together a consortium of Hawaii businesses engaged in various aspects of resort planning and development to seek China projects. An agreement was signed last night to involve the Integrated Development Group, a consortium of Hawaii companies, in the planning of a large resort for Tibet. "You don't build a presence in China overnight," Liu said. "You have to work at it. It takes time, and this is just one step in a long process." Scanning the Shanghai skyline Friday, Hawaii native Chris Bachran talked about hotel properties under his control. Bachran heads one of one of China's largest hotel chains and is among the first foreigners to helm a government-owned Chinese company. SHANGHAI » Two years ago, Kaneohe native Chris Bachran couldn't have imagined he'd be running China's largest hotel company with help from Cinderella. But you have to expect the unexpected in China these days. Today, the veteran hotelier oversees the hotel division of the huge state-owned Jin Jiang Group from a Spartan Shanghai office, shared by his Chinese assistant with the fairy-tale name. "It's not where I thought I would be now, but ... things happen," he said. When people look back at milestones in China's measured opening to the world, Bachran's name is likely to come up. Joining the company last year, the Damien Memorial School graduate is the first foreigner entrusted with the helm of a large state-owned business. It signals the realization by the Chinese that outside talent is needed to prepare its economy for competition with the rest of the world. Accepting the job was no slam-dunk decision. "But my wife asked me, 'Are you going to look back and wish you took it?'" he said. "It's a once-in-a-lifetime opportunity." Jin Jiang has more than 100 hotels in China, including some of the country's top properties. But it faces growing competition from international hotel chains as China's economy opens. Enter Bachran, who as a young man spent many a day surfing favorite Oahu breaks like Rockpiles and is now overhauling the hotels to meet the coming wave of competition. Bachran brings more than 30 years of experience to the job, starting with dishwashing jobs in Hawaii hotels as a teen. He later went onto post-college positions with the Royal Hawaiian and Sheraton Waikiki hotels before moving to Southeast Asia in 1985 and rising steadily through management positions with Radisson, Sheraton and others. He is in uncharted waters now. An outsider in such a high position is unheard of in China, but not for long. China's largest computer company, Lenovo, which recently bought IBM's personal-computer business, also will be headed up by an American, from IBM. 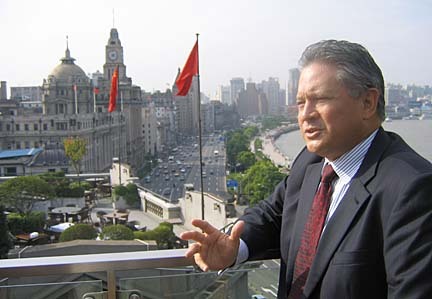 "(Bachran) is in a real pioneering role," said Jeffrey Bernstein, chairman of the American Chamber of Commerce in Shanghai. "His situation shows that China is serious about meeting the competition and that there are opportunities here for Americans to take part in some really monumental change." Bachran must contend, however, with Jin Jiang Group higher-ups who remain skittish about this new course. "There is certainly concern and a lot of oversight," he says. "The government really wants this to succeed." Dealing with the Chinese has been an adjustment for Bachran, who has some Chinese blood, along with Hawaiian, German and Irish. Accustomed to getting things done quickly, he is getting acquainted with the pace of a 5,000-year-old culture. "Here, there is a lot more 'process' put into things," says Bachran, a slight smile indicating that he is learning the Chinese art of not saying all that is on his mind. "It's sort of like the difference between haole and local. There are different ways of looking at situations, not to say either is better." Still, Bachran has managed to push through his top priorities such as hiring four foreign professionals to manage key areas like finances and sales. Three hotel properties now have expatriate management teams, and more are expected. Bachran would like to increase the number of Jin Jiang properties to 300 from 128 eventually. He is aided by the fact that unlike many state-owned companies, Jin Jiang does not suffer from huge debt. "Last year, we had a list of 120 things we wanted to do, and we finished 110. This year, we've got a list of 90 things, and I'm about one-third of the way there," he said. In sweltering Shanghai, one thing he would like to have on the list is a switch to aloha attire from his requisite suit and tie. "You don't know how much I miss that," he said as a jeans-clad Cinderella clomped out the door. "But I'm still working on getting these guys out of the jeans and T-shirt stage."